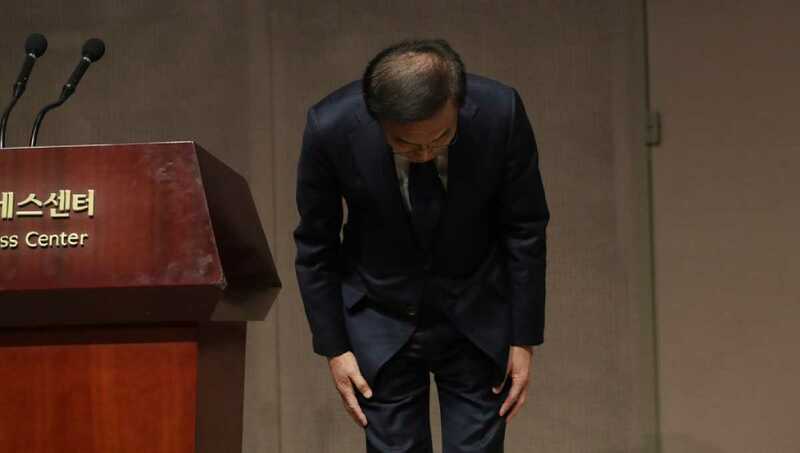 Photo: Kinam Kim, President & CEO, Device Solutions, Samsung Electronics bows in apology in Seoul, South Korea, Friday, Nov. 23, 2018. South Korea, Nov 23 : Samsung Electronics has apologized for the sickness and deaths of some of its workers, saying it failed to create a safe working environment at its computer chip and display factories. The announcement by the South Korean technology giant on Friday came weeks after the company and a group representing ailing Samsung workers agreed to accept compensation terms suggested by a mediator and end a highly-publicized standoff that went on for more than a decade. Samsung’s device solutions chief Kinam Kim says the company failed to “sufficiently manage health threats” at its semiconductor and liquid crystal display manufacturing lines. The civic movement against Samsung began in 2007 when taxi driver Hwang Sang-gi refused to accept as settlement after his 23-year-old daughter died of leukemia after working at a Samsung factory.